Thats me just back from a fantastic trip to the magical Isle of Islay. I’ve hosted trips to Islay for groups of whisky enthusiasts for many years, and this was the first of 2017. Our group was made up of 7 enthusiastic folk, some new to whisky, some seasoned enthusiasts, all set to visit Islay for the first time. We’d first talked of arranging this trip way back in September 2017, and it didn’t take long to fill it as word got round the regulars at The Earl Grey Inn in Leek that we would be Islay bound next spring. I had tried to prepare those that signed up for the expedition, I’d tried to explain what incredible experiences awaited them on the whisky isle, but it is very hard to do, very hard to describe the beauty and magic of Islay. The only way is to experience it at first hand, to make the long journey by road to the Calmac ferry terminal at Kennacraig, around the sea lochs of Argyll, to visit the distilleries and historic sites and to meet the people of Islay who make most beautifully complex whiskies in the world. There is nowhere else in the world that makes whisky that truly speaks of the landscape, whisky that when you stick your nose in the glass and have a good sniff it transports you to where it was distilled, the peat reek betraying it’s provenance. The island is certainly responsible for luring me in to the whisky world many years ago, I remember being given a glass of Caol Ila for the first time and being left in a state of shock by the intensity of its nose alone, even before I experienced the wonderful acidity and zestiness on the palate. My guests were in for a life changing treat. Our guests were due to arrive on the Monday evening ferry arriving at Port Askaig, they would then be collected by minibus from Islay Taxi and Minibus Hire. After a long journey from Staffordshire I knew they would be ready to sit in front of a roaring log fire and enjoy a couple of drams, even if they’d probably taken advantage of the malt of the month offer in the bar on the ferry. Our accommodation for the week was to be Octovullin Farmhouse which I often use for both whisky and fishing trips as it is extremely comfortable, spacious and well equipped. After a grand night’s sleep, and a hearty breakfast with meats supplied by Porters Butchers in Bowmore it was time to introduce our guests to Islay. (I’ve included our full itinerary below so that you can see exactly what one of our Guided Islay Distilleries Experiences looks like in detail). At 9am our cheerful driver Kenneth arrived to collect us and off we weeched our guests to their first distillery, the first distillery being Ardbeg no less. Here our guests enjoyed an in-depth tour with Ross and after that, they were to be treated to a tasting of many whiskies from the full range of Ardbeg. Smiles were all around, the biggest of all being on the face of our Paul who had set himself the challenge of finding a whisky to beat his favourite, Ardbeg 10 year old. He was to have much fun in his quest. And so were we. After our tasting we wandered down to the pier with a dram and gazed out to sea. Who else should put in an appearance but the otter. Perfect, right on cue. A packed itinerary meant that there was no time to stay for lunch at the popular Old Kiln Cafe as we had a date with Bruichladdich Distillery at 1pm. No horses were spared during Kenneth’s mission to deliver us in time for our next tour and tasting at Bruichladdich. This distillery built in 1881, the same year as Bunnahabhain in the North of the island, was built at a time when the whisky industry was in boom, due not least because of the decimation of the vineyards in Europe through the outbreak of the phylloxera epidemic. Cognac and Claret had been the alcoholic drinks of choice at the time and the canny Scotts stepped in to save the day by developing and marketing the Scotch industry. We had another great tour at what is about as close as one can get to being a working Victorian distillery, and then it was time for our guests to enjoy their first visit to one of the island’s fine dunnage warehouses for a tasting, this time straight from casks, and hosted by my former Caol Ila colleague Heather. 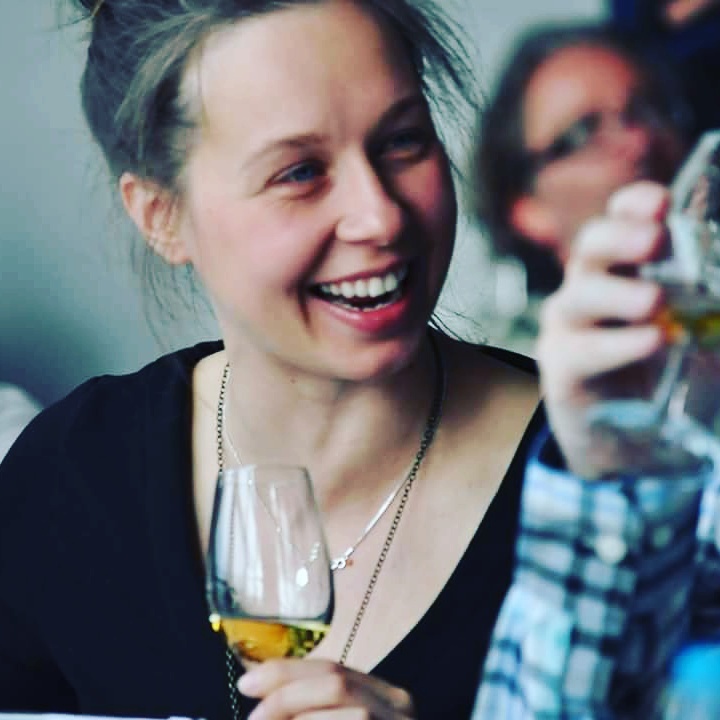 Heather has first hand experience of many of the Islay distilleries, after being lucky enough to work in many of them. She was good craic and kept our guests fully entertained and supplied with awesome vintage Laddies. We tasted some wonderful drams straight from the cask, the most popular being a stunning 1989 vintage American oak matured laddie. Delicious. After a full range tasting at Ardbeg, and now another flight of truly awesome drams my guests were beginning to feel the effect so it was off to the shop to pick up some bottles including the distillery only bottling known as ‘Valinch’. There is always at least one cask at Bruichladdich where visitors can bottle their own whisky, it is named valinch after the pipette type instrument used to draw cask samples. I’m told that valinch means ‘cask thief’ in Gaelic. We thought that after all that whisky, a little fresh air was the order of the day so Kenneth pointed the bus in the direction of Machir Bay and of we set for the beach, however, we would of course need to call in to Kilchoman Distillery as it seemed a while since we’d had a dram. Once again, bottles were eagerly gathered and finally we made our way to the beach. For one of us, tired and emotional, a wee paddle in the sea was the perfect antidote. If Tuesday wasn’t busy enough for my lucky guests, Wednesday was to packed with distillery activities and once again we headed off down to the South end of the island, to the Kildalton coast to visit the iconic Lagavulin and Laphroaig distilleries. At 9.30, the guys joined the tour of Lagavulin Distillery hosted by Sophie, before being taken down to a stunning dunnage warehouse where they would meet the Lagavulin Legend, Iain McArthur, a man who I’d had the pleasure of working with regularly in my years at Caol Ila and Lagavulin. 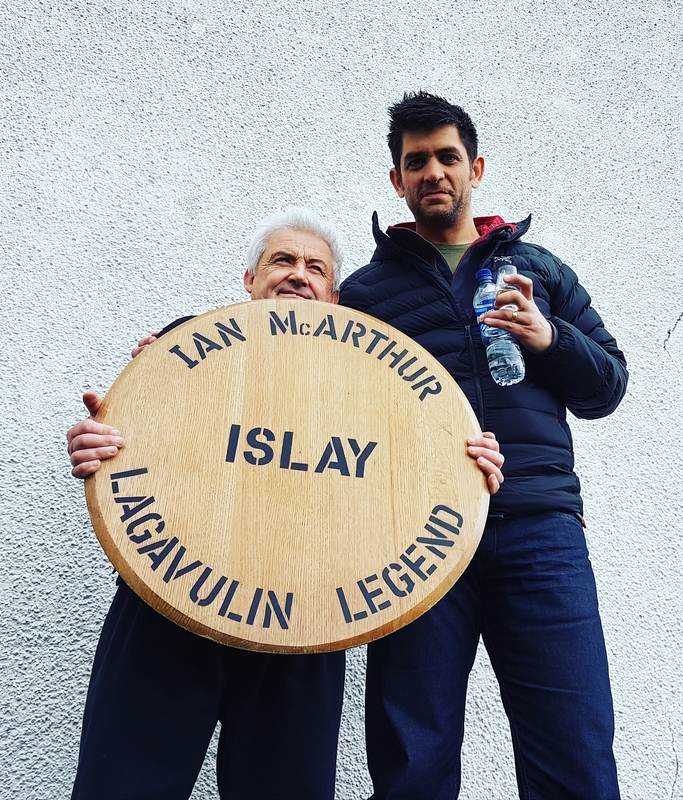 Iain’s Warehouse Demonstrations are famous the world over and people travel thousands of miles to hear his anecdotes and to have good craic whilst tasting awesome drams straight from the casks filled with various vintages of lovely Lagavulin. The tasting began though with a wee taste of the 2016 Islay Jazz Festival bottling which were still available in the distillery visitor centre, there would be a few less in the shop that morning. After visiting the Kildalton Cross and Chapel, it was time for Laphroaig where we would enjoy a distillery tour followed by drams. It was great to see traditional malt floors and kilning, and perfect for demonstrating how peaty Islay drams really speak of their provenance. The peat reek was starting to come in to play. We had an hour or so spare at the end of the day so Kenneth took us back up through Port Ellen and Bridgend via the High Road to Finlaggan, once the seat of The Lord of The Isles, and one of the most important historical sites in all of Scotland. The guests certainly appreciated a few lung fulls of good Islay fresh air after another day packed with stunning drams. And so the final day had come, and it was time to head for good old Caol Ila where until recently I was Distillery Manager. Caol Ila is by far the largest distillery on Islay, but that does not mean that the quality of spirit is any less. My go to dram was, and still is, and probably always will be from Caol Ila. We were met by my successor, Ed Thom who kindly looked after us for the morning, for which I and my guests were most grateful not just because of how well he looked after us but because he was also off on annual leave. Half way through the tasting, I realised that everyone had gone very quiet as we were sat in the cooperage at Caol Ila. I realised that a lot of pennies were beginning to drop and that guests were now really starting to understand the array and diversity of different spirit styles, flavours and profiles. They were also starting to realise that they were having the time of their lives. Proud to boast and show off my signatures and initials on various bottles in the distillery visitor centre, much to the amusement of Ed, many bottles were gathered and it was time to point the bus North, to another old stomping ground of mine, and a distillery very close to my heart. Bunnahabhain. At Bunnahabhain we were treated to a comprehensive tour and warehouse experience by the ever enthusiastic and knowledgeable David. We tasted incredible Bunnahabhains from an array of single casks but this time guests were able to buy and bottle their own drams in wee bottles, many of which will no doubt be proudly displayed in Staffordshire whisky cabinets. It was time for the last distillery visit of the week, this time at Bowmore, the first distillery on Islay to be given a license to distill back in 1779. Although this was the last distillery visit, it was not the last whisky experience. I had quietly planned with the help of a very good friend that my guests would enjoy a little peat cutting to round off their Islay experience, which all enjoyed, not least because of the tutor host. We had enjoyed perfect weather throughout our week, the food was fantastic, our hosts obliging, the whisky sang as ever and our guests eager to enjoy the experience as much as possible. Whether it is fishing experiences or whisky trips that I’m arranging it sometimes feels like cheating. Whether stood in a loch casting a line, catching or not catching, whether enjoying a dram on an Islay beach or in a dunnage warehouse, Islay does my work for me, my guests are blown away by the surroundings, the landscapes, the people, and the whisky. It is indeed a stunning place, and a place that is life changing for each who visits. If you would like to join us for an experience of a lifetime, please get in touch. We arrange scheduled trips during the year but we also arrange bespoke Guided Distillery Experiences for groups of friends or colleagues, we can tailor the trip to suit your time constraints, size of group and the amount of activities you would like to enjoy. As well as distillery tours and experiences we arrange sea safari adventures, shooting, fishing and many other exciting things to do. 10.45am Minibus collects guests from Caol Ila. En route to Bunnahabhain chance to see new site of Ardnahoe Distillery. ← Christmas 2016 Whisky Tastings! I would like to ask how much would this tour cost. Do you have tours for 2018 ? I/we are very interested in this. Please keep me informed as to when this will be available to book. Hi Mark, we have places available now for our Guided Islay Distilleries Experience at the Islay Whisky Festival 2018. I’ve only just started to promote it today so please let me know if you would like to book. Just sent you an email Mark with ref to our Guided Islay Distilleries Experience commencing 24th March 2018 and our Ultimate Guided Islay Whisky Festival Experience commencing 26th May 2018. Let me know if you have any questions or if you would like to book!